The Iranian media reported today that the country’s security forces have seized a major consignment of explosives during an operation in southeastern Sistan and Baluchestan. The Intelligence Ministry said its operatives confiscated the explosives while they were being smuggled into Iran from across the border. The restive Iranian province borders both Afghanistan and Pakistan, but the ministry did not disclose where the explosives came from. According to Iranian Students’ News Agency (ISNA) the seized cache included 80 kilograms of explosives, 17 booby traps, 28 handguns, 2,100 bullets, 35 grenades, electronic detonators and other explosive devices. Iranian officials said the ammunition and explosives were hidden under illicit drugs and were intended for terrorist attacks inside Iran. A large quantity of drugs was also seized. Comment: Over the past year, Iran’s southeastern and northwestern regions – home to marginalized ethnic and religious minorities – have seen an uptick in violence by separatist and militant groups. This year, the country’s security forces have captured several caches of explosives, suicide vests and ammunition in eastern parts of Sistan and Baluchestan. IRGC officials have blamed the Jundallah, a terrorist group that has a presence in Pakistan’s Baluchistan Province and has claimed credit for several attacks against Iranian security forces. With a sizable yet largely marginalized Sunni population, Sistan and Baluchestan can be a breeding ground for local militant and separatist movements as well regional and international terrorist groups such as the Islamic State and al-Qaeda. Sunni Baluchs, who constitute a plurality of the population in the province, have long suffered state-sanctioned discrimination, economic marginalization, cultural repression, disproportionate executions, torture, detention without trials and extra-judicial killings. Sistan and Baluchestan also borders Afghanistan and Pakistan, where the Islamic State has gained a foothold recently. Security is also tense in Iran’s western border provinces. 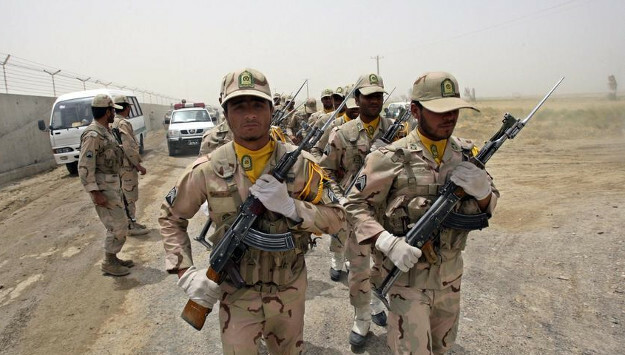 Earlier this year, unidentified gunmen killed and injured several Iranian border guards in West Azerbaijan Province near the Turkish border, the Iranian media reported. And in November, the Iranian media reported that at least eight Iranian border guards were killed in clashes with an armed group in the same province. A week prior to that, the IRGC announced that its forces “dismantled a terrorist team” in the same area. Iran’s Intelligence Ministry last year also revealed that the country’s security forces had disbanded nearly 100 “terrorist groups” across the country. “Highly serious measures have been taken in the Southern, Southeastern and Western parts of Iran and nearly 100 teams have been confronted," the deputy Iranian intelligence minister said.